Having a self storage unit is great. It can give you much needed extra space when moving, decluttering, renovating, or simply if you find yourself with a lot of extra things you don’t want lying around your home. Having a storage unit does, however, entail some organization considerations, lest your unit turn into simply an extension of your household clutter. 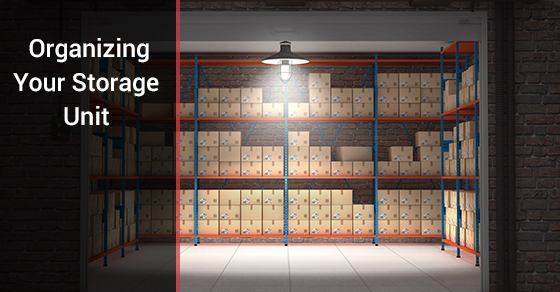 If you are setting up self storage units, below are 4 tips on how to organize your unit properly you are not going to want to miss. Many people are in such a hurry to get their belongings into their self storage units that they forget that, at some point, they are going to need to be able to access the unit and retrieve items. If you go crazy adding things to the unit, you might find yourself staring down an impenetrable wall of boxes and other belongings. If you suddenly realize you need to retrieve something from the very back of the unit and there is no way through, you will have to go through the hassle of removing the things in your way. Most storage facilities will offer you organizational tips if you are a first time storage unit user, but just in case they don’t, heavy items should go to the front. This will make unloading them much easier. Instead of having to lug a heavy, unwieldy item from the back to the front (and risk damaging other items in the unit), having it at the front means you can get it in and out fast. If you are putting a wide variety of things into a storage unit, especially if many of those things are being boxed-up, it is a good idea to create an inventory of exactly what you are putting in. In 6 months time you might not recall what went into box A or B and having an excel spreadsheet, or any document you can access letting you know what went where will make your life easier. A self storage unit should make your life easier and more organized, not the opposite. Keep the above storage unit organizational tips in mind when packing your unit and get the most out of your storage unit investment.